Not attending the Room Escape Conference? You Should Be! 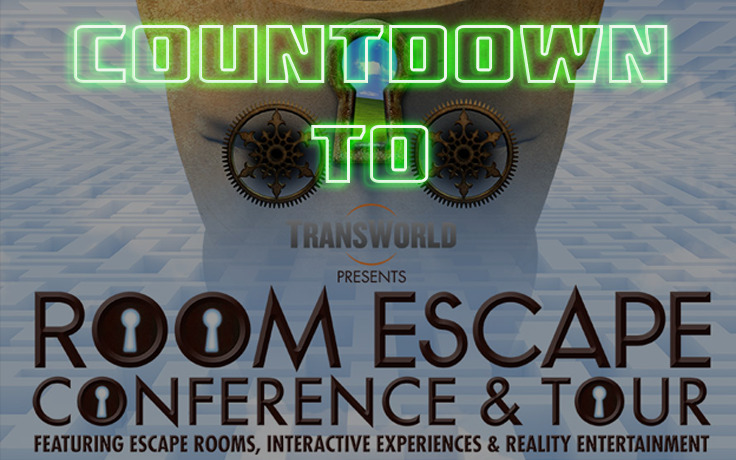 Following the incredible success of last year's Chicago Room Escape Conference (CREC) 2016, Transworld is again hosting an escape room specific convention, and it promises to be EPIC! (um, Brian, 2014 called and it wants it's trendy word back). This time in beautiful Niagra Falls, New York from May 1-5 2017. The conference promises to have everything that CREC had, and plenty more! If you are a new escape room entrepreneur or looking to get into the business this show is for you! This year promises to be even better than the inaugural event. 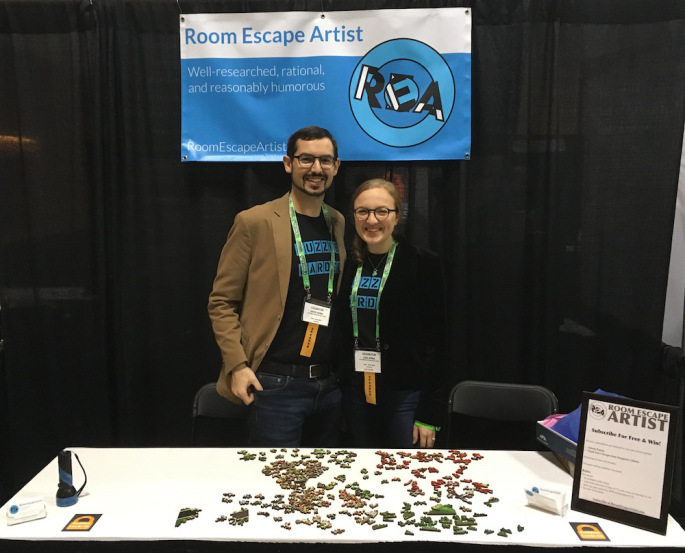 Last year I wrote 5 reasons you should attend the Chicago Room Escape Conference 2016, you can check that out here. Here are EVEN MORE reasons that you should attend the Transworld Room Escape Conference in Niagra Falls. What will this year's Room Escape Conference have? More of Everything! More seminars! More Vendors! More Great Networking! Last year there were so many great seminars that I attended that this year for me the hardest part is deciding which seminars to go to. As a new business owner at last year's conference, I wondered what kind of chops the presenters had and what made them experts in their fields. I will tell you I was not disappointed in the selection of seminars. This year's lineup has quite a few of the same speakers and I will be standing in line to go to many of them. There are so many great sessions to choose from. Do you want to open an escape room with children in mind? Go to the Little Kids = Big Market talk and learn how most escape room businesses are largely missing out on the lucrative family market. Are you trying to figure out this industry and don't know where to start? Go to the session Open Your Own Room Escape: A Complete Guide presented by Elizabeth Garson of Steelowl Productions. Last year, Elizabeth gave a great presentation on advertising and marketing your Escape Room, I still refer to material from this presentation almost daily. Anthony Purzycki, the owner of Trap Door Escape and host of web TV series "Unlocked" will be presenting Big Ideas for the Not So Big Budget: Guerilla Marketing. Anthony is a dominating power in the southern New Jersey Market with two locations. "Guerilla Marketing is the most overlooked aspect of escape room advertising. By the end of this seminar, participants will walk away supercharged with flash alternative marketing ideas." Last year, Anthony hosted a round-table discussion with other owners on the state of the escape room industry, it was a very insightful conversation. I wrote up what I learned from this discussion. You can read it here. The Escape Room tradeshow. Chicago Room Escape Conference 2016 snapshot video. Vendors, Props, Game Designs and SOOOOOOOO much more! Escape rooms are becoming entertainment destinations and people are hip to what a good escape room is and is not. What makes a great escape room? One of the major points is incredible props, puzzles, and scenery. A well written game, well designed, and well implemented has the potential to make you a ton of money. In just this short year the vendor and prop producers community has grown exponentially. At the show you will get to meet them face to face. Full Vendor List Here Want to add scents to your room? There is a vendor for you. Want a fully immersive, Virtual Reality experience? There's a vendor for you. Want custom built, high quality, electronic gadgetry? There are vendors for you. These shows are where you get an idea of the capabilities and possibilities of the industry. Escape Room scenery and prop designers Evilusions.com booth at the Chicago Room Escape Conference 2016. Uploaded by Brian Warner on 2016-09-16. Do you want to take your game mobile? There are builders of escape room trailers and collapsible mobile games on display. Do you want to host large scale games like the Zelda: Defenders of the Tri-force game? There are vendors that will help you design one. All this and so much more on display for you to see, feel, hear, and experience. There are also insurance vendors, advertising and marketing companies, as well as other niche markets. Meet notable industry experts, and me too! One of the greatest benefits of the escape room conference is the opportunity to gather and meet with industry experts and really pick their brains. This industry is young and there are some folks that have really made a name for themselves by either creating national brands, being featured on nationally syndicated TV shows, or designing experiences for huge companies like HBO and Universal. Notable among the presenters are David and Lisa Spira from RoomEscapeArtist.com a couple that travel around the nation and write unbiased reviews of escape room experiences. David and Lisa have amazing insights into how we can provide a better experience for our guests. Last year I was a bit overwhelmed and didn't really take full advantage of the opportunity. This year it's GAME ON! Look for me, I will be everywhere in my noticeable Chartreuse Green polo shirt and name tag. I don't profess to be an industry professional but I would love to meet other owners, or people looking to start their own escape room. I will have a pocket full of business cards and you should too. Each night there is at least one mixer or other event that is put on by Transworld and there are sure to be other unofficial events that you will want to jump into as well. After hours there are unofficial networking events where owners get together and talk about the state of the industry while having a few tasty beverages. Here are 5 things I learned from other escape room owners. I have never been to Niagra Falls and always wanted to go, now is my chance. I even heard that there's an escape the Niagra Falls Barrel escape room. It's a one player game where they lock you in a barrel and throw you in the river. You have an undetermined amount of time to get out of the barrel before it goes over the falls. It currently has a 0% success rate. I kid, I kid. But there are opportunities to visit other local escape adventures and even get tours of their facilities. Check out the tours page for all the details. Don't forget to save your receipts so you can write this trip off on next year's taxes! Brian Vinciguerra is a retired Marine and is the co-founder and chief marketing officer of Cracked it! Escape Games in Jacksonville, North Carolina.